Briefly, John Wienke was a part of the class of 2008. He committed to the Wolverines on July 1, 2007. He was a 3-star quarterback coming in a year after Ryan Mallett, and why would a surefire star want to follow Mallett so closely just to sit on the bench? The coaches didn't set their sights too high, and they landed Wienke, a decent but middling recruit. Then Lloyd Carr retired, Rich Rodriguez was hired in December, and the writing was on the wall. Before the ink dried on Rodriguez's contract, the lefty quarterback was out the door to be an Iowa Hawkeye. With his 6'5", 215 lb.-and-growing frame, nobody thought he'd stick around to be a human victory cigar, a la David Cone or Darko Milicic. He was a pro-style pocket quarterback for an offense that produced the NCAA's all-time leading rusher for quarterbacks in Pat White. For the time being, Wienke has been doing the same thing at Iowa as he would have at Michigan. Wienke redshirted in 2008 and played third fiddle in 2009, failing to throw a pass all season. Wienke's departure was the most tenable of the class of 2008's decommits. It was best for both parties. And judging from recent quarterback play at Iowa, he will likely take over whenever Ricky Stanzi leaves and play decently until he fades away into obscurity like Drew Tate and Brad Banks . . . and every other Iowa quarterback. Seriously, has any good quarterback ever come out of Iowa? Chuck Long won the Heisman back during Prohibition, but if they were any worse at producing NFL quarterbacks, their mascot would be Brutus. Even Indiana had Trent Green. Christian Wilson, a 6'3", 235 lb. running back/tight end from McKees Rocks, PA, committed to Michigan back in 2007. He was expected to be a part of the class of 2008 after Lloyd Carr convinced him that he could play an H-back role in Mike Debord's offense. It's somewhat odd that Carr would recruit a guy for a position that didn't really exist when he probably knew that he wouldn't be there past the 2007 season. Regardless, the hiring of Rich Rodriguez forced Wilson to rethink his options. Rodriguez honored the offer and told him that he could play linebacker, but Wilson wasn't interested. He pictured himself as an offensive player, but Wilson would only fit Rodriguez's offense as a fullback . . . and Rodriguez molds his fullbacks out of walk-ons. Wilson took the hint and opened up his recruitment. He committed to North Carolina and played as a freshman. 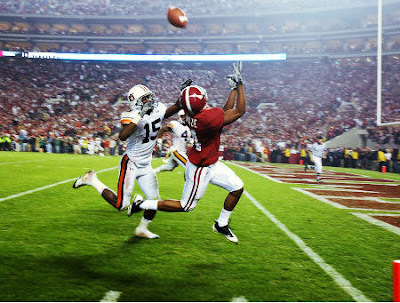 He caught 2 passes for 19 yards as a true freshman in 2008 and added 5 more catches for 30 yards in 2009. Michigan's starting fullback in 2009 was Kevin Grady, who notched 10 carries for 80 yards and 1 touchdown. He also caught 5 passes for 29 yards. Grady was probably a better player for Michigan's offense, but moving forward, the fullback duties will fall to fifth year senior Mark Moundros and redshirt junior John McColgan. It would be nice to have an athlete of Wilson's caliber to play fullback, but considering the fact that a former 5-star running back in Grady only touched the ball 15 times, committing a four-year scholarship to a fullback might not make a great deal of sense. It would be nice to have an extra inside linebacker on the roster, but if Wilson didn't want to play defense, he probably wouldn't be great at it, anyway. "WTF are you lookin' at?" For the first time this year, an offensive lineman gets the call. Goodwin played center for the New Orleans Saints as they advanced to the Super Bowl with a victory over the Minnesota Vikings on Sunday, 31-28. He helped Drew Brees, who was only sacked once by Minnesota's all-star defensive line, to throw 3 touchdowns. Honorable mention: Braylon Edwards of the New York Jets had 2 catches for 100 yards and 1 touchdown, including an 80-yarder. David Harris, also of the Jets, had 11 tackles and 2 sacks. But both of those players lost this weekend to the Colts, so they're runners-up this week. Jibreel Black, a 6'2", 253 lb. defensive lineman from Cincinnati, OH, committed to Michigan on Sunday. He's the 26th addition to Michigan's 2010 class. Black is a 3-star defensive end to Rivals and a 4-star defensive tackle to Scout. It seems a bit up in the air as to what position he's going to play at Michigan. Some seem to think that he'll pack on some pounds and play 3-tech defensive tackle for the Wolverines, and some think he'll lean out and remain at strongside defensive end, the position he played in high school. If it means anything, his brother Larry is a 6'2", 306 lb. redshirt freshman defensive tackle for Indiana. As a junior, Black racked up 76 tackles and 8 sacks. He added 61 tackles and 10 sacks as a senior. Michigan offered him prior to his senior season, so the coaches have been going after him for a while. Black has suffered from a bout of indecision, however. He's been committed to Indiana and, most recently, Cincinnati before settling on Michigan. There's only a week before National Signing Day, but I'm not going to trust that he's set on Michigan until he faxes that letter of intent to Ann Arbor. He might end up back with Cincinnati or Indiana, or perhaps he'll entertain his offers from Illinois, Michigan State, South Carolina, West Virginia, and Wisconsin, among others. As for projecting him forward, if Black remains at Michigan, I expect that he'll step into the 5-tech defensive end spot previously held by Brandon Graham. When watching his film, he looks almost like a clone of Graham. He's short-ish and thickly built. Perhaps the best thing I see on film is the way he keeps his shoulders square to the line. Too many talented athletes in high school fire off the ball and shoot straight for the ball carrier, but college opponents will take advantage of that lack of discipline. His fundamentally sound positioning shows that not only is he coachable, but the biggest obstacle for him might be his strength and conditioning. He does play a little upright, but at only 6'2" and going up against tackles who are three to five inches taller than him, leverage shouldn't be a major issue. I'm sure Michigan's coaches will work with him on staying lower, being explosive, and using that leverage to the best of his ability, but that's not a big concern. Black will probably redshirt in 2010. He's got some bad body weight on him and needs to lean out. There's very little depth at defensive end, but I imagine the 5-tech defensive end spot will be played by Ryan Van Bergen. Will Heininger is an experienced backup, and Anthony Lalota will be a redshirt freshman, but he's a project. I think Ken Wilkins, who's 246 lbs. and a workout warrior, will eventually be a 5-tech. But Black might be the best of the bunch. 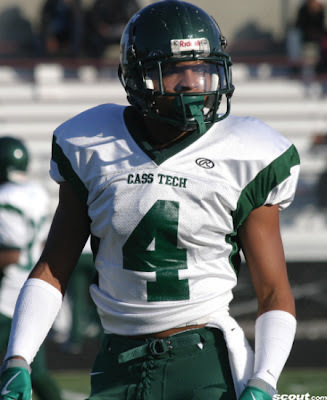 Cornerback Delonte Hollowell, a Class of 2011 recruit from Cass Tech High School in Detroit, MI, committed to the University of Michigan two weekends ago. He had been hinting at an impending commitment to Michigan for a few weeks, and he actually committed silently to the coaches a week before it became public. Hollowell is listed at 5'8" and 163 lbs., so he follows in the line of midget cornerbacks that Michigan has recruited out of Cass Tech. Class of 2008 cornerback Boubacar Cissoko, class of 2009 slot receiver/cornerback/slot receiver Teric Jones (who's moving back to offense for the spring), and class of 2010 cornerback Dior Mathis (committed to Oregon) were all listed in that 5'8" range. Their one Big Ten-worthy defensive back who hasn't been offered by Michigan is Daniel Easterly, who's 6'4" and headed to Missouri this year. Hollowell is Michigan's second commit overall - and second cornerback commit - of the 2011 class. Greg Brown, from Fremont, OH, committed back in September. With at least three cornerbacks in the 2010 class and anywhere from 3-5 safeties, don't expect Michigan to pursue many more defensive backs in 2011. They'll probably go hard after safety Ron Tanner, from Columbus, and that might be it. As with most short cornerbacks, I'm not a big fan of the Hollowell commitment. Short cornerbacks automatically have issues with bigger receivers, and Michigan seems to be recruiting a lot of them recently. I wasn't enamored with either Cissoko or Mathis when they were coming out of high school (Teric Jones only played offense), but I'd take both of them over Hollowell. He lacks the elite athleticism and speed that the other two seemed to have. Hollowell does have excellent hands and adjusts well to the ball when it's in the air. But I'm afraid that bigger and/or faster wide receivers will give him trouble at the next level. Jake Ryan, from St. Ignatius High School in Westlake, OH, committed to the University of Michigan on Sunday. Ryan is a 6'3", 225 lb. linebacker and Michigan's ninth defensive commitment of the last ten. He's rated as a 3-star recruit by both Scout and Rivals. Ryan's teammate, Scott McVey, was the more heavily recruited player at St. Ignatius, but Ryan outplayed him during their 2009 season. McVey had an offer from Michigan but chose Ohio State and, thus jinxed by God, suffered nagging injuries as a senior. While McVey played middle linebacker in St. Ignatius's 3-3-5 stack defense, Ryan mostly played right outside linebacker. Other schools to offer Ryan included Bowling Green, Toledo, Ohio, and Eastern Michigan. But when he officially visited this past weekend, Rich Rodriguez extended an offer that got accepted almost immediately. In interviews with Ryan and his high school coach, they have said that Michigan recruited him as outside/rush linebacker. That seems to be in line with the Quick end position, currently manned by rising sophomore Craig Roh. However, that seems odd, considering that no less than four other players in the class of 2010 have been recruited to play Quick at various times: Jordan Paskorz, Ken Wilkins, Antonio Kinard, and Davion Rogers. A recent Rivals article quotes Kinard as saying he'll play WILL, so that makes a little more sense. And personally, I think Paskorz is better off as a defensive end. But still, I have questions. Regardless, I think Ryan is best suited for middle linebacker. He seems to do a good job of diagnosing plays and taking good angles toward the ballcarrier. He has a solid frame and could easily play at 240 or 245. He's reported to run a 4.6 forty yard dash, but I question that time. Ryan is stiff in the hips. He moves well for a high school linebacker, but he looks like a defensive end who's playing out of position at outside backer. He does not have great lateral speed, and I do question his tackling ability. Despite a couple highlight films I've seen, I haven't seen a single de-cleater. All of his tackles seem to be him falling on a player who's already going down or grabbing a runner and letting his 220-225 lbs. drag down the ball carrier. He doesn't have the aggressiveness I would like to see in a kid that size at the linebacker position, but he was suffering from a wrist injury, so that might have made him a bit tentative. Ultimately, Ryan is either a Quick linebacker or a MIKE. I'm leaning toward the MIKE position because of the shortage of inside linebackers on the roster, but it won't surprise me either way. No other player who was recruited for the Quick position has the ability to play middle linebacker, so either Ryan plays there or Michigan better go after some good inside linebackers in 2011. Image via the Cleveland Plain Dealer. Davion Rogers, a linebacker from Harding High School in Warren, OH, committed to Michigan yesterday after an official visit. He just recently procured an offer from the Wolverines after having been committed to West Virginia. Rogers' teammate is D.J. Williamson, a Michigan wide receiver commit. Rogers is a 3-star linebacker to both Rivals and Scout, ranked as the #26 outside linebacker to Rivals and the #96 player at his position on Scout. Along with being a former Mountaineer commit, Rogers had also been reported to have interest in his Michigan State offer. Michigan's coaches recruited Rogers for the Quick end position, currently manned by Craig Roh. When Roh arrived in the summer of 2009, he was 238 lbs. Rogers is currently 6'6", 210 lbs. and needs to bulk up before he can expect to contribute. Physically, he's very reminiscent of former Michigan outside linebacker Shawn Crable; Crable was listed at 6'6", 230 lbs. coming out of high school, but he ended up around 245. Watching film of him, Rogers has incredible physical talent. The most impressive thing about him is his speed. He's able to catch up to skill players from behind. His wingspan also helps him latch onto and wrap up players who might be out of a shorter player's reach. Once he gains strength, that wingspan should also afford him the ability to keep offensive tackles out of his chest. Unfortunately, one of the reasons that Rogers gets to show off his speed so much is that he tends to take poor pursuit angles. That's typical for many talented athletes, but it's something that will have to be corrected. Hopefully, his speed will result in a similar awesome play to Crable running down Michigan State's A.J. Jimmerson from the opposite side of the field a few years ago. Rogers also tends to reach when tackling. He leaves his feet or stops his feet in order to reach out and tackle, which will be a problem against stronger, faster players. Rogers is a few years away from contributing. Craig Roh has a similar skill set and his backup, Brandon Herron, offers a different type of skills. It should take a year or two for Rogers to gain enough strength to contribute, and his techniques will have to develop and mature as his strength does. Considering Brandon Herron will be a redshirt junior in 2010, I expect Rogers to redshirt as a freshman and then compete for playing time in 2012 when Roh is a senior and the whole world is wiped off the planet except John Cusack. In the Arizona Cardinals' overtime victory against the Green Bay Packers, Breaston caught 7 passes for 125 yards and a touchdown, to go along with one carry for 28 yards. Honorable mention: On the opposite side of the ball, Packers cornerback Charles Woodson made 6 tackles, broke up one pass, and forced a fumble. Unfortunately, his team fell to the Cardinals, 51-45. Wide receiver Marquis Maze was committed to be a member of the 2007 recruiting class. Recruited as a wideout for Michigan, he always seemed to be a bit undersized; he was 5'8" and 160 lbs. during a time when Michigan was annually churning out 6'3"-ish wide receivers like David Terrell, Marquis Walker, Braylon Edwards, and Adrian Arrington, among others. Before signing day arrived, though, Maze decommitted from the Wolverines and decided to attend Alabama. He redshirted as a freshman in 2007 and has earned more and more prominent roles the past two seasons. Unbeknownst to him, Michigan coach Lloyd Carr would be replaced by Rich Rodriguez in December 2007, who would bring an offense in which Maze could have thrived. Rodriguez was reduced to playing a true freshman (Martavious Odoms) and a bigger receiver who was a misfit (Toney Clemons) at the slot receiver position in 2008. Odoms did well, but Clemons floundered and transferred to Colorado prior to the 2009 season. This past season as a redshirt sophomore and now listed at 5'10" and 180 lbs., Maze started at wide receiver and recorded 31 receptions for 523 yards (a 16.9 yard average) and 2 touchdowns, including an 80-yarder. Oh by the way, he also won a national championship. Meanwhile, the majority of Michigan's snaps at slot receiver went to the trio of Kelvin Grady, Martavious Odoms, and Roy Roundtree. Those players combined for 64 catches, 808 yards (12.6 yard average), and 5 touchdowns. Redshirt freshman Roundtree turned out to be the most explosive of the three, leading the entire team in each category and besting Maze in receptions (32 to 31) and touchdowns (3 to 2). Maze is a big-play threat for the Crimson Tide, but his presence on the Michigan team in 2009 probably wouldn't have made a huge difference. He would have been more valuable in 2008, when he likely would have started for then-freshman Odoms. Still, Maze has a good thing going at Alabama, and Michigan has some promising athletes going forward into the 2010 season. This is a departure that most Michigan fans shouldn't - and probably don't - regret. Quarterback Ryan Mallett was an early commitment in Michigan's 2007 recruiting class. Always considered to be headed to Arkansas, he instead chose to become a Wolverine because he didn't want to sit behind Mitch Mustain at quarterback for three years. He thought it was a better idea to sit behind senior Chad Henne for one season and take over Lloyd Carr's quarterback factory of an offense in 2008. Unfortunately for Michigan, Mallett didn't like the cold and wasn't a model citizen. He considered transferring practically when he arrived at Michigan in Winter 2007, and he followed through with those plans as soon as Rich Rodriguez was hired in December 2007. As a freshman in Carr's final year at the helm, Mallett played for Henne when the latter injured his knee and shoulder. Mallett even started a couple games and finished the year 892 yards, 7 touchdowns, 5 interceptions, a 43.3% completion percentage, and a 105.69 passer efficiency rating. But his taste of playing time wasn't enough to convince him to stick around for Rodriguez's read option offense. Arkansas quarterback Mitch Mustain had transferred to USC, and Mallett transferred to Arkansas to fill his position. He appealed to the NCAA in an attempt to allow him to play for Arkansas in 2008, but lost and had to redshirt last season. In 2009, Mallett started for Arkansas and finished the season 225/403 (55.8%), 3627 yards, 30 touchdowns, 7 interceptions, and a 152.52 passer efficiency rating. He had -29 yards rushing with 2 touchdowns on the ground. He's explored the possibility of jumping to the NFL early, and he's been talked about as an early Heisman candidate for the 2010 season. By comparison, Michigan's quarterbacks - mainly Tate Forcier, with bits of Denard Robinson, Nick Sheridan, and David Cone - finished the 2009 season 189/329 (57.4%), 2380 yards, 15 touchdowns, 15 interceptions, and a 124.14 passer efficiency rating. They also rushed for 608 yards and 8 touchdowns. The offense would not have been the same with Mallett, who's about 6'7" and 235 lbs. He would have been less of a threat to run than Forcier or Robinson, but the passing game likely would have been upgraded if Mallett were still in Ann Arbor. Michigan's lack of a downfield passing game was evident in 2009, and that's one thing Mallett would have improved. Charles Woodson had 1 pass interception and 2 pass breakups in the Packers' 33-7 win over the Arizona Cardinals. The interception was returned for a 45-yard touchdown. Honorable mention: The stats may not seem like much, but the Denver Broncos' Ty Law is a 35-year-old cornerback, which is a rarity in the NFL. He broke up a pass and returned an interception for 37 yards as the Broncos lost to the Kansas City Chiefs, 44-24.